Enjoy family time at the National Museum of Singapore every last Saturday of the month! There are many fun line-up of activities includes interactive tours, storytelling sessions, family workshops, drop-in craft activities, captivating performances, and more. This September, Family Fun coincides with the closing weekend of their special exhibition, The More We Get Together: Singapore’s Playgrounds 1930–2030. Seize your last chance to contribute suggestions for your dream playground of the future, admire the rippling effect of The Dynamic Lines of Our Nest installation, and enjoy playground-inspired bouncy castles! Don’t miss out on hearing Gran’s stories of Saturday nights spent at the Great World amusement park, and making your own pop-up motor car at the craft station on the third floor. They will also be launching a series of early learning booklets which will guide your young ones to trace their numbers, ABCs and colours while playing spot-the-artefact in the permanent galleries. - Drop-In Craft Activity – Make Your Own Pop-Up Motor Car! The motor car as a means of transport was first introduced to Singapore in 1896, and gradually replaced the use of the horse and carriage by the 1930s. Cars then started featuring in children’s toys, such as the Matchbox series of miniature vehicles that was introduced in 1953. Come create your own pop-up motor car, inspired by the one in our Growing Up gallery! Limited to 15 pairs of parent & child, on a first come, first served basis. On-site registration starts from 10.30am at the Rotunda, Level 1. Join for a learning journey around the museum and discover more interesting gems about this 130-year-old building. Did you know that “Great World” is the name of a famous amusement park in the 1930s? Come listen to the friendly grandmother Mdm Si-Hoe Sow Sing speak about her Saturday nights spent there with family, and Sundays when she and her nine siblings would cram into the family car on an outing to the Chinese Swimming Club. 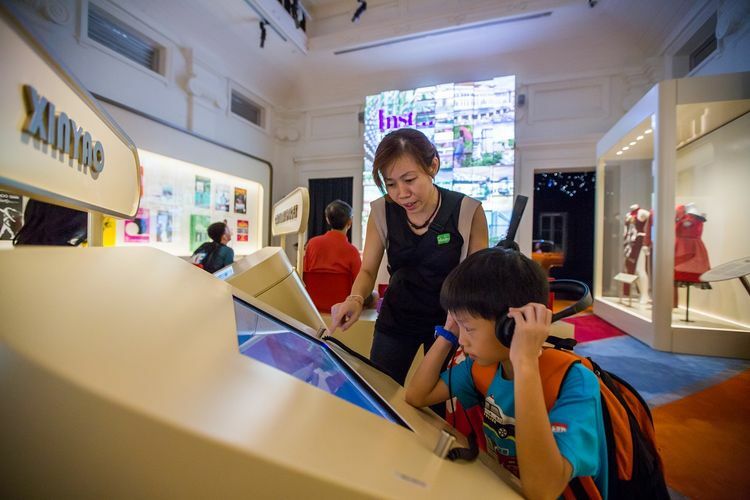 Featuring engaging dramatisation and interactive hands-on activities, these storytelling sessions are a wonderful introduction to Singapore’s history and heritage, as told through our grandmas’ first-hand experiences! Each session is limited to 15 children aged 7 to 12 years old, on a first come, first served basis. On-site registration starts from 1.45pm outside the Growing Up Gallery, Level 2. Embark on a bouncy adventure at the National Museum with interactive inflatable playgrounds inspired by iconic mosaic playgrounds of yesteryear! You can also go on an “animal hunt” with animal springers for more bouncy fun. Parental supervision is required at all times. All footwear (except socks) is to be removed before entering the inflatables. Please note that play under wet or hot weather conditions is not advised. Visit our permanent galleries and play spot-the-artefact! These colourful booklets introduce pre-schoolers to artefacts according to the themes of Numbers, Colours, and ABCs.